Trails are usually open from December 1st to April 15th, weather permitting. Trails are generally groomed once a week, but may be groomed more depending on conditions. Be sure to check the grooming report before heading out, especially in the early or late season. Chief Joseph pass has over 13 miles of ski trails, expertly groomed with a state of the art PistenBully grooming machine. The ski trails are open for use by Skate and Classic skiers, and snowshoers. All ski trails are set with tracks for classic skiing, on one or both sides and have a wide lane for skating. 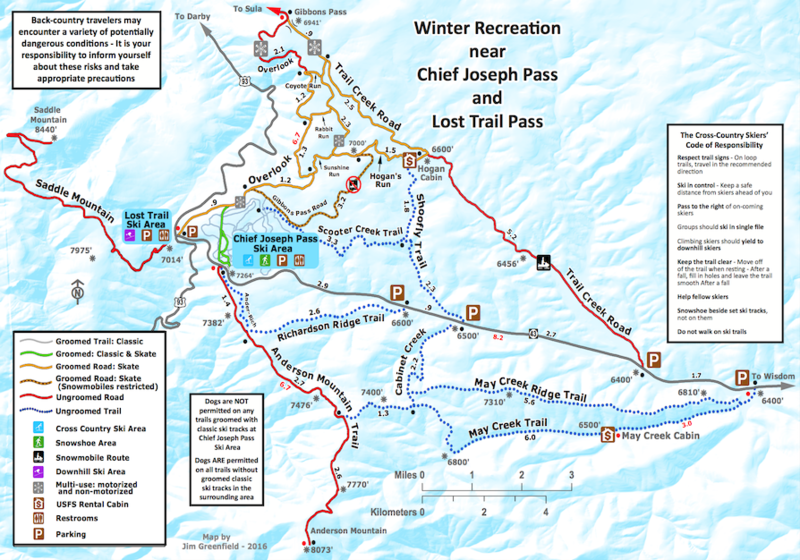 The ski trails can be accessed from the trailhead at Chief Joseph Pass. Dogs are not allowed on any trails groomed with classic tracks. Trail difficulties range from easy (green) to difficult (black) and are appropriate for every level of skier from beginner to expert. People of all ages and abilities use these trails (toddlers to retirees) for fun and fitness. Every trail junction is marked with a trail map—it’s almost impossible to get lost—and benches are placed at appropriate spots along the trails for those needing a short break or a place to sit while enjoying a snack or the wonderful views. Chief Joseph pass has nearly 20 miles of of multi-use trails. The multi-use trails are appropriate for skate skiing, dog sledding, snow shoeing, fat-tire biking, and snowmobiling. 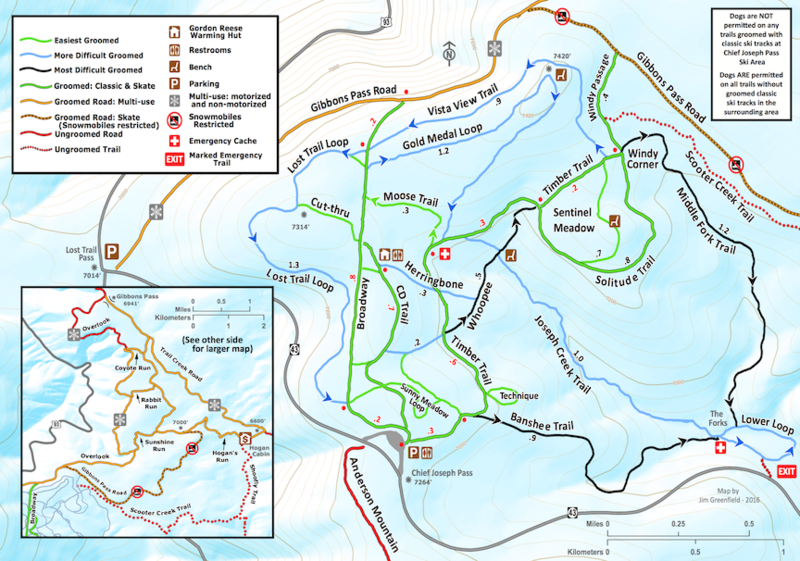 The multi-use trails are generally wider than the ski trails, and do not have tracks set for classic skiing. The multi-use trails can be accessed from the parking area just east of Lost Trail Pass. Dogs are allowed on the Multi-use trails. The Chief Joseph Pass area features many miles of trails that are marked for skiing, but are not groomed. These trails are appropriate for experienced winter travelers on backcountry skis or snowshoes. Click on either map image below to view at a larger scale.